It has long been a port Android to x86 and processors Intel Atom, in particular. Moreover, the chipmaker has repeatedly demonstrated a smartphone based on the Linux operating system and proprietary SoC, but the problem is that currently only supported by Android 2.3. According to official data, Intel already is working on adapting the latest Google Mobile Platform, Android 4.1 Jelly Bean, a processor and SoC Atom. 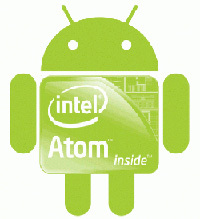 Intel is working closely with Google, to add support for future versions of Android, including the Jelly bean in a family of energy-efficient processor Atom. With these processors, the company still hopes to find its niche in the market of smartphones and tablets, which is now almost entirely occupied by the ARM. In the example of competitors Intel puts its x86-effective solutions and their optimization for Android, when the single-core processor is much more efficient than today’s multi-core SoC architecture based on ARM. Chipmaker accused of competitors in their own lack of optimization solutions for Android.